Why Buy a Sports Attack Baseball Pitching Machine? Everyone knows live pitching offers the best training, but good batting practice pitchers are hard to find. With the three-wheel design you can see the ball clearly all the way through the feeding motion, acceleration and release, just like a live pitcher. The hitter sees when to stride and the angle of release, giving him an actual live-arm sense of timing and location. With a quick turn of the dials you can effortlessly throw major league fastballs, and right and left handed breaking pitches including curveballs, sliders and split fingers. Throwing head pivots instantly in any direction for all fungo work including deep fly balls that can drive fielders to the fence, slicing line drives, catcher's pop-ups with reverse spin, towering infield pop-ups, and grounders. Makes most efficient use of practice time with limited throwing head adjustments needed and an almost instant recovery time. More strikes delivered at every practice! Both of our pitching machines quickly move on and off field, just tilt it, unsocket legs and easily roll on two transporting wheels. Both pitching machines are designed for use with regulation leather baseballs, dimpled practice balls, Wiffle® balls and all softer practice balls. The Junior Hack Attack will also convert to throw a 7.5” undersized vision training ball. No assembly is required, both pitching machines arrive fully assembled and ready for your immediate use. 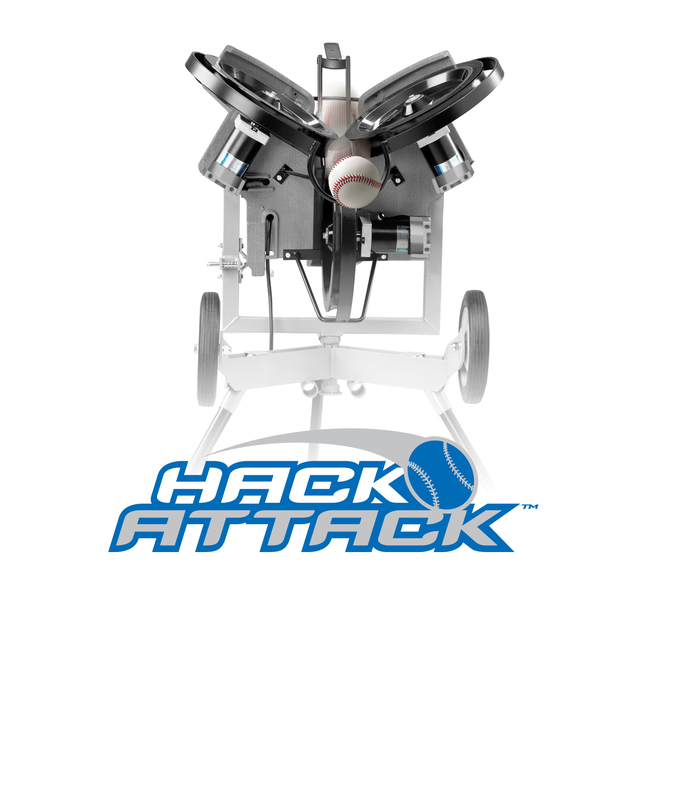 Hack Attack baseball pitching machines are heavy enough to absorb recoil, ensuring accuracy, yet portable and easily moved by one person. Extra wide tripod base insures real stability and safety on pitching mounds or baseball playing surfaces.